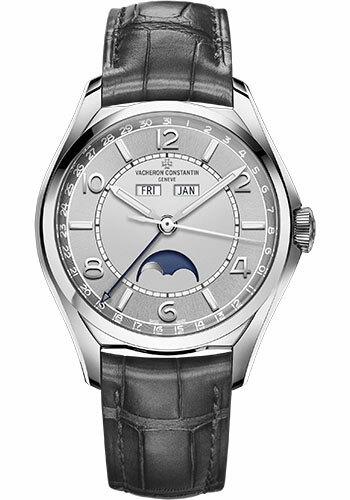 40.00 mm stainless steel case, 11.60 mm thick, transparent sapphire back, grey dial, Caliber 2460 QCL/1 automatic movement with hours, minutes, month in aperture, hand-type date, center seconds, precision moon phase, day of the week in aperture, approximately 40 hours of power reserve, dark grey alligator Mississippiensis strap, stainless steel deployant buckle. Water resistant to 30 meters. delivered with a corrector pen. 40.00 mm stainless steel case, 11.60 mm thick, transparent sapphire glass back, stainless steel crown, stainless steel bezel, blue dial, Caliber 2460 QCL/1 automatic movement with hours, minutes, month in aperture, hand-type date, center seconds, precision moon phase, day of the week in aperture, approximately 40 hours of power reserve, dark blue alligator mississippiensis strap, stainless steel deployant buckle. Water resistant to 3 bar. delivered with a corrector pen. 40.00 mm 18K 5N pink gold case, 11.60 mm thick, transparent sapphire back, silver dial, Caliber 2460 QCL/1 automatic movement with hours, minutes, month in aperture, hand-type date, center seconds, precision moon phase, day of the week in aperture, approximately 40 hours of power reserve, dark brown alligator Mississippiensis strap, 18K 5N pink gold ardillon buckle. Water resistant to 30 meters. delivered with a corrector pen.